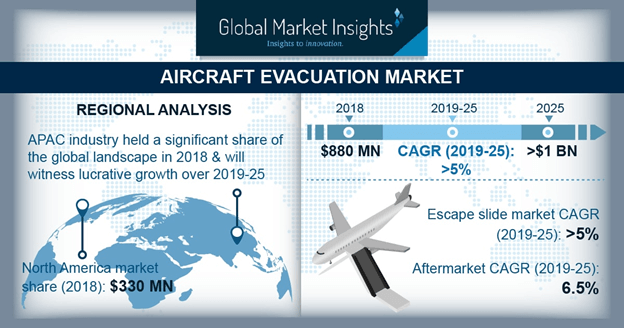 Aircraft Evacuation Market size is estimated to exceed USD 1 billion by 2025; according to a new research report by Global Market Insights, Inc. Stringent government regulations for passenger safety will drive the aircraft evacuation market size over forecast period. According to the European Transport Safety Council, around 90% commercial airplane accidents categorized are technically survivable. Implementation of advanced systems to reduce fatalities in accidents or emergency landing will enhance product demand. Proliferating military expenditure across the globe will propel aircraft evacuation market size. In 2018, the U.S. government allocated around USD 700 billion for defense sector. Further, rising passenger traffic will augment industry growth. According to the World Bank Group, in 2017, total air passengers reached 3.98 billion with an increase of around 7.5% as compared to 2016. Ejection seat will witness significant growth over the forecast timeframe with increasing investments from defense sector to develop advanced products. In April 2017, the U.S. Air force contracted United Technologies Aerospace Systems and Martin Baker for development and manufacturing of evacuation ejection seats, providing a positive outlook for the industry growth. Fixed wing platform leads aircraft evacuation market share owing to increasing demand for commercial aircrafts to accommodate air passengers. Emergence of new industry players in aviation industry will enhance segment penetration over study timeframe. In February 2018, Commercial Aircraft Corporation of China (COMAC) announced the delivery of its first C919 single-aisle jet by 2021. Increasing airplane deliveries will drive the market growth over study timeframe. For instance, in 2018, Boeing announced to deliver around 42,730 aircrafts by 2037. Growing airplane fleets will induce significant potential in industry size. However, high investment requirement for cabin crew training programs will limit the market growth. Ongoing development of advanced evacuation systems such as sensing devices and lightweight fabric for evacuation system will augment the market share. In March 2014, Trelleborg AB announced the development of a new coated fabric for air plane evacuation slides. This will enable air plane manufacturers to meet the stringent regulatory requirements for evacuation system design and operation. OEM holds substantial revenue share with increasing demand for air carriers across the globe. Replacement of existing airplane fleet owing to ageing airplane to meet government regulations for airworthiness are positively influencing the segment growth. Moreover, development of low-cost carriers coupled with increasing demand for narrow-body aircrafts such as A320, B737, A319, and B757 will enhance the segment dominance till 2025. Europe aircraft evacuation market holds substantial share with the expansion of airlines. In August 2018, Wizz Air announced expansion of its flight network with 11 new routes. Airliners are developing escape slides to provide enhance seating. In September 2018, Lufthansa Technik along with EAM Worldwide developed a high-performance exit slide. The slide allows airlines to reduce space required for storing slides and can add seating capacity by six seats. Asia Pacific aircraft evacuation market share will witness a significant growth owing to increasing demand for air travel. Further, as per IATA, the region is witnessing an annual increase of around 5.5% passenger traffic. Continuous investments by industry players for setting up of manufacturing facilities are further supporting the regional growth till 2025. Major market players include EAM Worldwide, Martin-Baker Co. Ltd, Survitec Group Limited and Survival Equipment Services. Partnerships and joint ventures are among the prominent strategies adopted by the industry participants to expand their presence in the marketplace. For instance, in July 2017, Survival Equipment Services announced a strategic partnership with Task Aerospace Inc. This partnership enabled company to expand their services & maintenance segment for ejection seats by including ACES, NORTHROP, ESCAPAC, and SIIIS seats.